The UMP Late Model point battle continues to heat up as the season begins to wind down at Oakshade Raceway with Casey Noonan earning his second UMP Late Model Feature win on Swanton Sports Center Night which moved him up to third in those point standings. Dusty Moore began the evening with a one point advantage over Rody Schroyer and caught a bad break early in the UMP Late Model Feature. Moore spun in between turns one and two just after completing the second lap to bring out the only caution of the race. Noonan, meanwhile, took the lead after starting on the pole and began to distance himself from the rest of the field. Rusty Schlenk and Justin Paxton had a great battle going most of the race for the second position, about a straightaway behind the race leader. Noonan masterfully worked through some heavy lapped traffic on his way to picking up the checkered flag. Paxton made a last lap pass to narrowly edge out Schlenk for second. Rody Schroyer took over the point lead from Dusty Moore with his fourth place finish after starting 14th. Zac Davis slipped back to finish fifth after starting on the outside of the front row. Moore ended up 12th. Rookie UMP Sportsman driver Matt Lindsey started on the pole and looked strong in the early laps of what turned out to be a very eventful UMP Sportsman Feature. Bruce Stuart was challenging Lindsey for the lead in the first couple laps until he spun and collected Joe Smith to bring out the first yellow flag. Jerry Urbanowski finally took the lead from Lindsey on lap five, but a few laps later, Urbanowski got held up behind a lapped car and Brian Fisher took advantage and snatched the lead away as Ky Harper followed him into second. Shortly after attaining the lead, Brian Fisher’s car slowed which brought out another caution. While under the caution, a fire broke out under the rear of Kerry Rouse’s automobile. The fire was quickly extinguished, but Rouse’s night was over. Ky Harper found himself with the lead as the field went back to green flag racing. Urbanowski reclaimed the top spot by lap 14 and one lap later, Harper retired to the pits turning over the second position to Tim Fisher. Fisher was unable to catch Urbanowski before the checkered flag flew, but after Urbanowski went across the scales for the post-race inspection, it was found that his car was 20 pounds under weight. Urbanowski was disqualified and Tim Fisher was presented with the Swanton Sports Center UMP Sportsman Feature winner trophy. Rusty Smith start 17th and had a great run to finish second. Matt Lindsey held on to finish third followed by Joe Derbeck and Oakshade’s UMP Sportsman point leader Mike Jessen. B.J. Gregory was the benefactor of a few well-timed caution flags in the UMP Bomber A Main, but it wasn’t enough to get him to the checkered flag. Gregory darted out into the lead at the start and was quickly pursued by Garry Domoe. Oakshade UMP Bomber point contender Chris Henry had quite a scare after he and Ron Leonard and Dave Sibberson came together on lap three to bring out a yellow. Henry’s car suffered damage, but was able to continue. Henry is second in points behind Jim Scout. Domoe continued his bid for the lead and passed Gregory on a few occasions and each time the caution flag would fly soon after allowing Gregory to retain the lead. Domoe then had his hand full with a hard-charging Brett Miller late in the race who got by Domoe and then got alongside Gregory for the lead as the white flag waved. Miller made the pass and went on to pick up the victory with Gregory and Domoe finishing close behind. Craig Dippman was fourth with Danny Hogrefe ending up fifth after starting deep in the field. Once again, the brand new UMP Hornet class featuring front-wheel drive four-cylinder cars for drivers 12 to 18 years old fielded the largest field to date which allowed for their first feature event under the lights. Tyler Line and Ben Liaeff battled for the lead early with Line eventually taking command. Dylan Burt and Dylan Herman tangled to bring out the first caution of the race. Both drivers continued on. Liaeff took advantage of Line’s car being slow as he came back up to speed on the restart and took the lead away. Line finally got back up to speed and drove way too hard under Liaeff as they entered turn three. The two drivers hit and spun. Brett Shaw and Curtis Spurgeon were also collected in the incident that took all four drivers out of the race. Gabe Mueller assumed the lead for the restart, but missed a shift when the green flag flew. Dylan Herman and Dylan Burt both passed Mueller for the top two spots. Fourteen year old Herman went on to pick up his second consecutive UMP Hornet Feature win. Mueller was able to get back by Burt to finish second. Kyle Nowicki and Derek Morris rounded out the rest of the top five finishers. Next to take the track was the UMP Bomber B Main. Brice Luttrell got by Ray Klawitter on the first lap and went on to lead the entire distance of a caution filled race. Jeff Strock had a pair of spins. Jeff Browns came to sudden stop exiting turn four while running in third. Klawitter and Matt Rose got together on lap five. Joe Heffner spun in front of a lot of traffic on the backstretch a lap later. Jeremiah Floyd brought out the final caution after he spun in turn one to set up a one lap shootout to the finish. Luttrell went on to hold off Roscoe Stetten to pick up his first feature win of the year. Curt Lancaster finished third followed by Dan Plath and Nate Goodman. The carnage continued in the UMP Bomber C Main after a big pile up on the backstretch on the first lap brought out the red flag. Some of the drivers involved included Brian McKenzie, Jason Doty, Chris Sands and Kevin Cole. Wade Rick of Delta, Ohio got the early lead after the complete restart and tried to pull away from the rest of the field, but a few more cautions kept things somewhat tight. Rick went on to pick up his second feature win of the year. Jake Reckner finished second with Steve Reeves taking third. Josh Overmyer started last and worked his way up to finish fourth even with all of the caution periods. Cody Houston started on the pole and slipped back to finish fifth. The rescheduled Butch Wildermuth Memorial takes place Saturday, August 2 at Oakshade Raceway as part of the American Late Model Series event that will pay $3000 to the feature winner. UMP Sportsmen, UMP Bombers and UMP Hornets will also be in action with gates opening at 4pm and racing at 7pm. 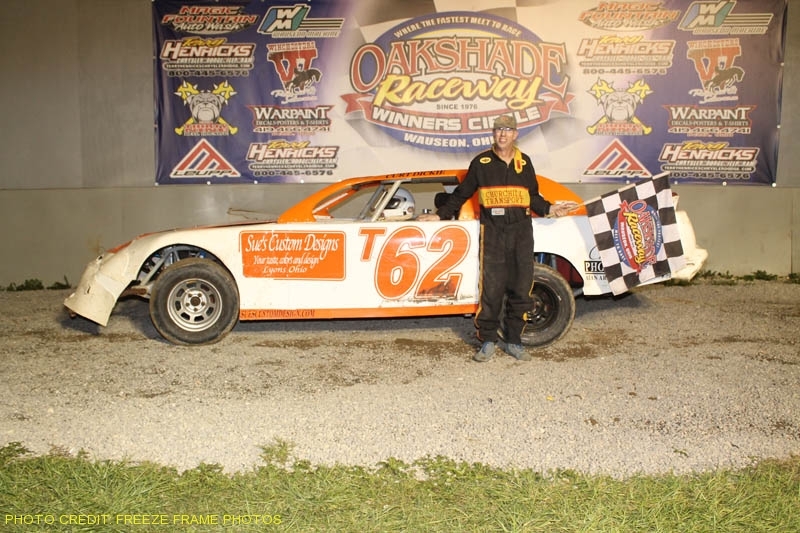 The grueling month long UMP DIRTcar Summer Nationals Series wrapped up at Oakshade Raceway on Saturday night with Matt Miller finding his way back to victory lane for the second time this year. Dennis Erb entered the night with just a four point advantage over Brian Shirley in the UMP DIRTcar Summer Nationals point standings. Shirley had his work cut out for himself after having to take a provisional just to make the 60-lap Oakshade Raceway Birthday Race UMP Late Model Feature event. Erb started near the front on the inside of the second row while Shirley started 20th. Wes Steidinger finished second in last year’s Birthday Race and snatched the lead at the start after starting on the pole. Steidinger then began to pull away from second place Kris Patterson in the early laps. Dennis Erb, with the UMP Summer Nationals title on the line, suffered a close call shortly after the start as he and Jason Feger got together on the backstretch with both drivers almost ending up in the wall. They checked up and continued on only losing a few positions and getting minor damage to each car. Last year’s Birthday Race winner Jeep Van Wormer took second from Patterson and then began to make up ground on race leader Wes Steidinger. Van Wormer got up to the rear bumper of Steidinger at one point while working lapped traffic, but Steidinger turned on the afterburners and once again pulled away with the lead. Steidinger suddenly slowed off the pace on lap 33 after losing his drive shaft which brought out the yellow flag and ended his night. That turned the race lead over to Pinconning, Michigan’s Jeep Van Wormer. Zac Davis had a strong run going in the third position, but a few laps after Steidinger’s misfortune, Davis spun in turn two to bring out another caution flag and sent him to the tail of the field. Matt Miller then got up alongside Van Wormer and battled for the lead with Miller eventually taking it around lap 38. Brian Shirley’s hopes of winning the UMP Summer Nationals title were dashed on lap 39 as his car rolled to a stop on the backstretch. Shirley had fought his way up through the field to sixth before suffering mechanical problems that took him out of competition. Matt Miller went on to dominate the final stages of the race by opening up a big lead over Van Wormer and the rest of the competitors won the 11th Annual Birthday Race/UMP DIRTcar Summer Nationals Finale. Matt Miller was presented with a check for $10,000 for the victory. Jeep Van Wormer finished second with Dennis Erb third. Erb was also crowned the 2008 Summer Nationals Champion, his second consecutive Summer Nationals Championship. Doug Drown finished fourth with Casey Noonan fifth. Craig Dippman and Brice Luttrell came together at the start of the UMP Bomber A Main and both drivers went head on into the backstretch wall as they came off turn two. Danny Hogrefe was also collected in the incident that resulted in a complete restart. Chris Henry took advantage of the restart and led the entire distance on his way to capture his sixth A Main win of the year. Despite all of his feature victories this year, Henry is still second in Oakshade Bomber points to Jim Scout who finished a close second in the feature. Ron Bloomfield Sr. and Randy Roseman battled hard for the early lead in the UMP Bomber B Main. Bloomfield assumed the lead over Roseman by the end of the second lap. Dan Shaffer then began to pressure Bloomfield for the race lead, racing side by side for a few laps until finally taking command on lap seven. Shaffer went on to pick up his first feature win of the year with Randy Roseman finishing second. Chris Howard, Dustin Sautter and Matt Rose rounded out the rest of the top five finishers with Bloomfield dropping back to finish eighth. Jerry Signor fought off a heavy challenge from Ron Leonard early in the UMP Bomber C Main. Jeff Strock spun and collected Jeff Grochowski and Jesse Moyer to bring out the yellow flag on lap two. Leonard relinquished second on the track as he retired to the pits while the field was under the yellow flag. That moved Karl Spoores up to second and he and Signor traded paint and the lead shortly after the restart. Spoores eventually got the lead and then Signor slowed on the backstretch and went to the pits. That turned second over to Chuck Faller who then proceeded to spin in turn one bringing out another caution. Spoores went on to pick up the victory. It was his first of the year as well. Tim Line was second and Jeff Strock recovered after his earlier caution to finish third. Kevin Cole finished fourth and Josh Overmyer was fifth. The UMP Hornet class of front-wheel drive four-cylinder cars for 12 to 18 year olds continues to grow each week and produce fun racing action. Fourteen year old Dylan Herman fought off last week’s winner, Ben Liaeff, to earn his first win of the year after a close call on the final lap with the lapped automobile of Stephanie Miller. The Vintage American Race Cars will join the UMP Late Model, UMP Sportsman, UMP Bomber and UMP Hornet show at Oakshade Raceway on Saturday, July 19. Gates will open at 4pm with racing action beginning at 7pm.